With three days of events on a sprawling campus around Staples Center arena in downtown Los Angeles, NBA All-Star Game highlights included the Rising Stars game on Friday night; the slam dunk, 3-point, and skills challenges of All-Star Saturday Night; and the 67th NBA All-Star Game on Sunday. Among live broadcasting, in-arena events, and visiting media crews, Firehouse was responsible for RF coverage throughout the Staples Center, along with managing and coordinating more than 1,000 frequencies throughout the surrounding campus, which included hundreds of media crews and several outdoor stages across the LA Live plaza area in front of the Microsoft Theater. The on-site Turner studio broadcast team, from studio hosts to courtside reporters, was miked with Axient analog handheld transmitters equipped with KSM8 capsules, and Shure’s ShowLink system for full remote control and monitoring. 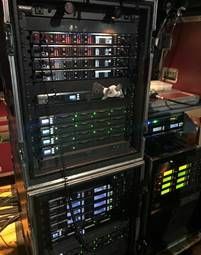 For musical performances by stars like Pharrell Williams, Common, Andra Day, and Jaden Smith, Dittmar used 16 channels each of Axient Digital wireless and PSM 1000 in-ear monitors. “The performance on Axient Digital is off the charts, especially operating range,” Dittmar commented.